SINGAPORE - The Singapore passport has retained its place among the top five most welcomed passports by countries around the world. 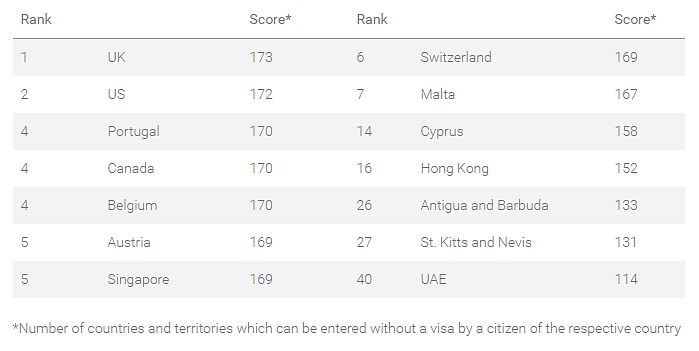 The United Kingdom and Germany retained top spot with visa-free access to 173 countries, while Finland, Sweden and the United States jointly took second spot with 172 countries. Japan and Korea were ranked joint-third with 171 countries. The biggest mover this year, according to Henly & Partners which produces the index, was the United Arab Emirates. It moved up from 55th to 40th place and added 37 countries to its score. Check out the full index here. For information on the countries where Singaporeans still need a visa, visit the Ministry of Foreign Affairs website here.